What is Solvit Cargo Area Net Pet Barrier? The Solvit Cargo Area Net Pet Barrier keeps pets in the back of the car and off your seats, giving you the peace of mind knowing they can't jump in your lap or get under your feet while you drive. The barrier is made from a micro-mesh material that is designed to be easy to see through and "claw proof." The mesh netting is attached to a pop-up wire frame that keeps the net from sagging and makes it easy to install and uninstall. A central support rod increases the net's strength, and a tubing device with attached strap helps hold the net barrier firmly in place. It is designed to fit all vehicles with headrests. It also comes with a handy storage pouch for your convenience. 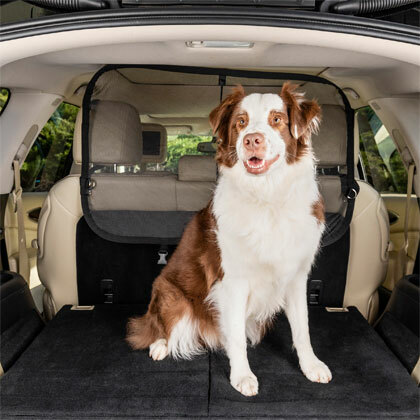 Once you've installed the Solvit Cargo Area Net Pet Barrier in your car, your pets can enjoy the ride in the back, and you can feel good knowing they won't be trying to get under your feet or jumping in your lap while you drive. The mesh barrier is attached to a coiled metal frame which might pop open when removed from the pouch. Remove carefully in an open area. Handle with care. The mesh barrier is attached to a coiled metal frame which might pop open when removed from the pouch. Remove carefully in an open area. The pouch should contain the mesh barrier and a support rod. This barrier is designed for installation behind the middle or third row bench seat in all vehicles with headrests. Allow the mesh barrier to 'pop open" to its natural, rectangular shape. Assemble the support rod with the coupler between the two straight sections. Insert one end of the support rod into the small 'pocket" at the bottom edge of the barrier. Bend the support rod slightly and insert the other end into the pocket at the top edge of the barrier. On each end of the barrier, there are two cinch straps, a lower set, for attaching to the headrest post, and an upper set, for looping around the headrest cushion. With the support rod on the front facing side of the barrier, wrap the upper straps over the headrest cushions and loop back through the cinch straps under the cushions. Leave these straps loosely connected for now. Next, thread the lower straps around the outer headrest posts, and loop back through the cinch rings. Tighten each cinch strap so the barrier is centered between the two headrests. If the bench seat has a split in the back, the included tubing can be used for additional stability. Run the strap through the split to the front side of the seat and push the plastic tube into the space between the seat back and seat bottom . Tighten the strap attached to the tubing so the bottom edge of the barrier rests firmly against the back of the seats. (It might be necessary to hold the tubing in place while adjusting the strap). The tube can be removed with a strong tug, but should stay in place under normal conditions. To fold down the barrier for storage, remove the support rod, then, while holding the left and right sides, twist your hands in opposite directions while bringing them together. The wire frame should form three concentric circles. Align the circles, then place barrier in the storage pouch. Handle carefully. The barrier can pop open unexpectedly if it's not held in this stowed position. Clean up messes with damp sponge or cloth.